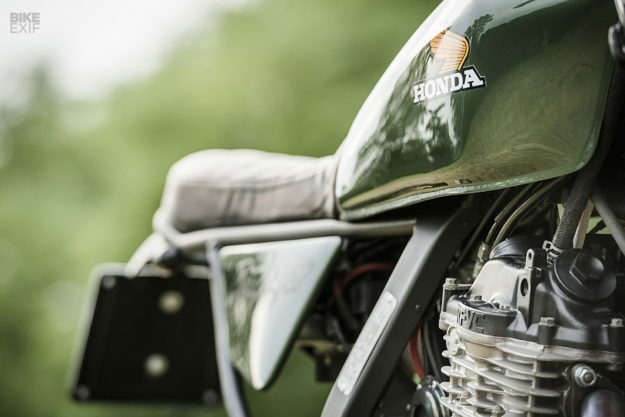 We all love gushing over high-end custom motorcycles, but the truth is that these incredible machines cost real money to build. Which begs the question: is it possible to create something truly cool, without breaking the bank? 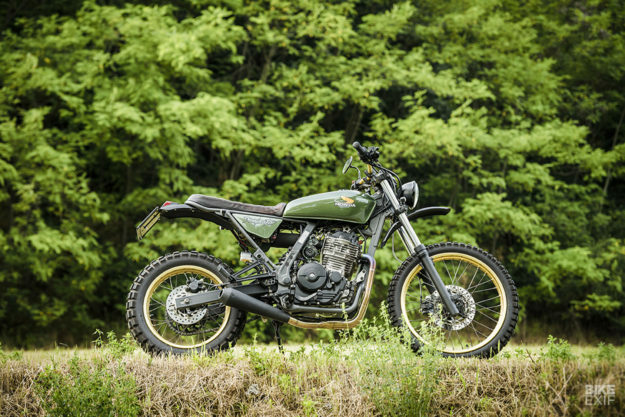 This 1994 Honda Dominator 650 from North East Custom in Padua, Italy says Heck Yes. Brothers Diego and Riccardo Coppiello have made good taste their hallmark, and the tight budget on this project hasn’t held them back one bit. Sure, there’s nothing revolutionary or over the top about this thumper—and North East know it. But their goal was to build a neat and simple daily runner that could head to the hills on the weekend, and they nailed it. Most of the work happened at the rear, where the guys tailor-made a new, looped subframe for a cleaner effect—and to accommodate a new perch. 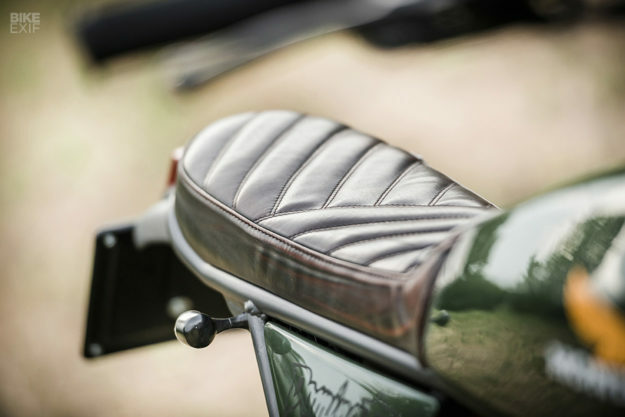 The custom-made seat is long enough to take a pillion, and upholstered in brown leather with a unique slanted pattern. Even more work went on under the seat, where North East spent time repositioning all the electrical bits to keep things tidy. They also ditched the Dominator airbox in favor of a foam filter. A new pair of side covers was then fabbed up to hide everything away, with the brothers taking design cues from the fuel tank’s silhouette. 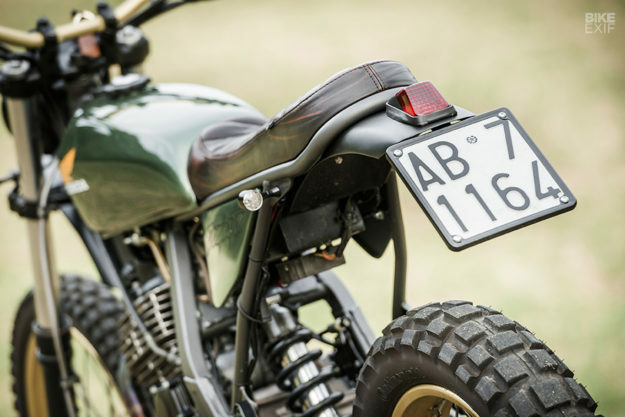 The tank itself is from a Honda CG125, and it was a perfect match after it was modified to fit the Dominator 650 frame. 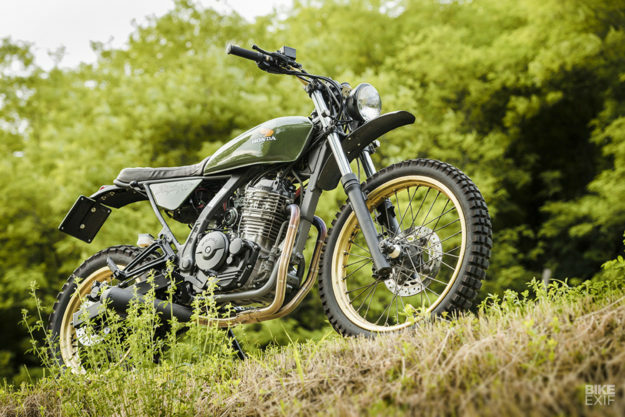 Though the Dominator has shed its plastic bulk, it hasn’t lost any of its old-school dirt bike appeal. North East capped it off with high fenders at both ends, and even picked an enduro-style taillight to drive the point home. 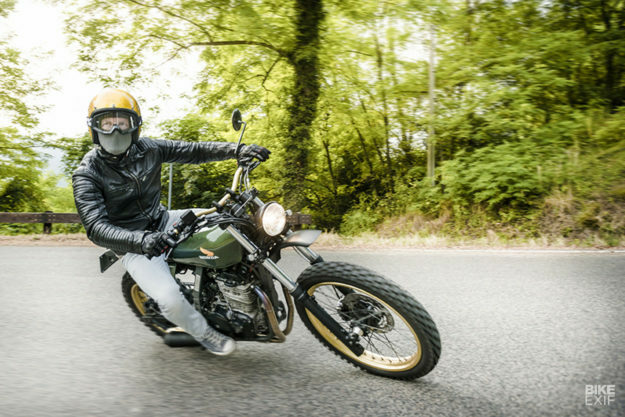 They dropped the front forks ever so slightly—and stiffened them—to improve the stance and handling on the road. But they kept the stock 21F/17R wheels, and wrapped them in Continental’s popular TKC80 dual-sport tires for maximum grip when things get sketchy. They even left the wheels in the original gold, echoed up top by a set of gold handlebars. The cockpit’s also sporting a new set of grips and an MMB speedo—with a hand-made bracket designed to play nice with the stock ignition. 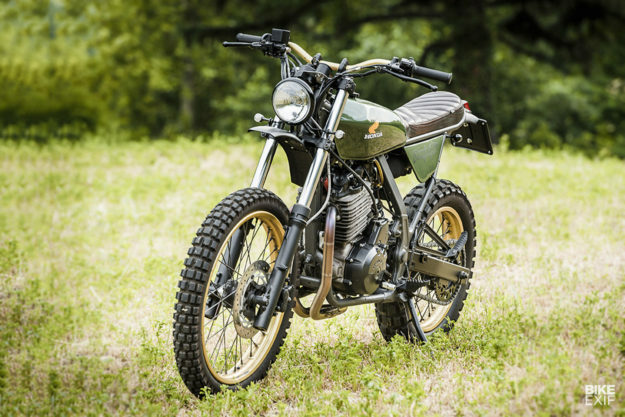 The lighting package includes a Bates-style headlight, and small LED turn signals on custom mounts. 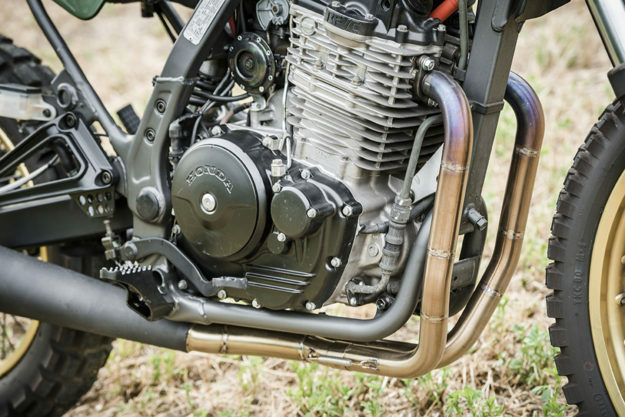 The Dominator’s one of the few single-cylinder bikes with dual exhaust ports, giving Diego and Riccardo the opportunity to go to town on the exhaust. So they ditched the OEM high system in favor of hand-made, two-into-one headers, terminating in an off-the-shelf muffler. The Dominator’s killer new stance and lines are matched by an equally well thought out color scheme. The brothers were after something elegant, so they opted for ‘metallic sage green’—a hue found on the Mini Countryman. They then added the iconic Honda wing logos to the tank, and the original 80s ‘Dominator’ graphics to the side covers, as a nod to the original bike. Every last inch has been considered. The frame’s been done in dark grey, and the engine’s been cleaned up and treated to complementing black and raw finishes. Even the fork lowers and swing arm got a fresh coat of black. 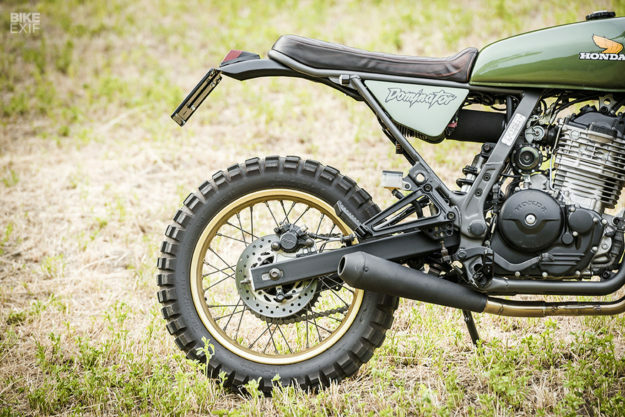 The result is a funky scrambler that proves that you don’t need to fork out for a Walt Siegl Leggero or a Mule flat tracker to be cool. Just as long as you have the right donor—and as much talent as the Coppiello brothers.